Manage your Game Studio, earn big bucks, impress the critics, beat rival studios and clean up at the awards! 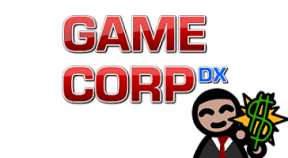 Based on the Flash game that has been played over 5 Million times, Game Corp DX is an enhanced version that has been built from the ground up to be enjoyed on PC, Mac and Linux with proper full screen support, faster performance, Steam features and a lot more polish! Build your Game Corp from scratch and make it into the best one ever! Expand your Studio and your team, hire new workers, train them to use better tools and use those tools to make better games! Train your workers to the max and create the ultimate Game Developer team! Publish your games, impress the critics and beat the other Studios at the Annual Videogame Studio Awards!